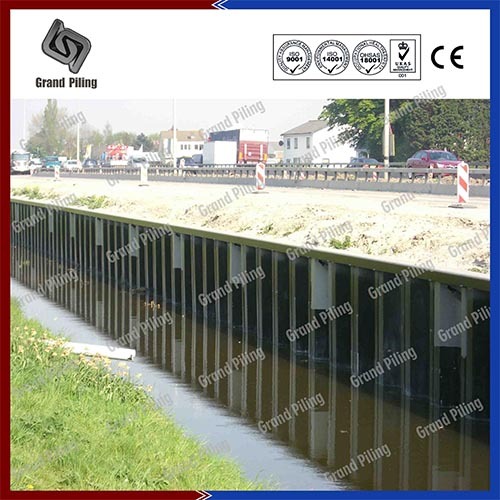 Grand Piling has been the biggest supplier in Indonesia market during the past years. Numerous orders and inquiries are generated from Jarkata, Semarang, Tandjungpriok, Surabaya. Although Grand Piling can do the design work ourselves,this job was designed by an European company. 1560 tons of AZ18-700 in various length are used. Half sheet piles were painted on the top 7 metres on the front side and the top 4.0 metres on the back side with 375 microns of Jotamastic 87 black paint. All painting works were carried out in the factory in China. Analysis was performed for a variety of load cases, considering stage by stage construction and the resulting cumulative effects. These piles are for de-watering works, groundwater cut-off walls and pollution control situations. This pile with its light weight, wide profile and minimal clutches also provides an attractive commercial proposition for retaining walls and other applications. No moment reduction will be applied to the walls due to relative soil / wall stiffness considerations.he results obtained from the analysis of local stability using the above considerations were considered Design Values with no further addition of factors or extension of the embedment.